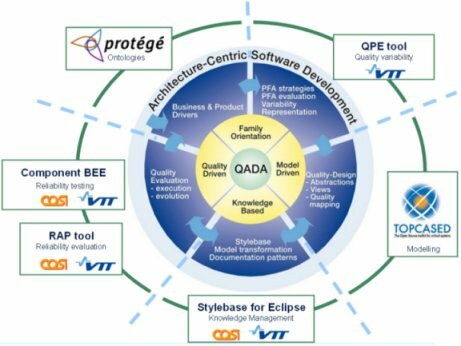 Since 2006, VTT has been developing an Eclipse-compatible, open source tool chain to support modelling of quality-driven software architecture. The tool chain covers each phase of QADA methodology as presented by Figure. The tool chain does currently consist of the following six tools (four of them have been developed in VTT). Protége is an open source ontology editor. 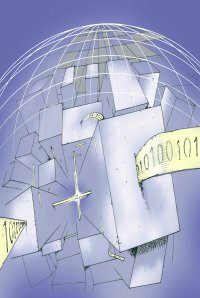 Ontologies are used for representing quality attributes in an universal way. The ontologies contain e.g. metrics for quality measurements and dependencies between these metrics. The quality ontologies are stored in OWL-format. Quality Profile Editor (QPE) reads the OWL-formated quality ontology and architect can select metrics and corresponding target values for each quality. In addition, one can define varition in quality properties as well as relationships and dependencies between the qualities. QPE stores defined quality properties in an UML profile. TopCased tool is used for modeling software architecture in UML language. It also facilitates mapping quality profiles (created with QPE) into architectural elements. Stylebase for Eclipse lets and architect to search styles/patterns from the knowledge base and select solutions which best support the desired qualities. Stylebase makes it possible to present evolution qualities. RAP (Reliability and Availability Prediction) reads models created with the Topcased tool and uses them to assess reliability of each software component. The main outcome is reliability values of components, execution paths and reliability value of the whole system.